CDR - Records AS is an independent record label located in Stavanger, Norway. The label was started in February 2013. The first band signed to CDR Records was SAVN, featuring Carmen Elise Espenæs (MIDNATTSOL), Stig Johansen and Anders Thue (Both THE SINS OF THY BELOVED), and their debut album is scheduled for release spring 2014. Worldwide distribution by Intergroove and Believe Digital. Album will be release on CD Digipak, 12" LP Gatefold and 12" Picturedisc. The complete artwork of SAVN's debut album is now finished thanx to the amazing designer Jan Yrlund (Darkgrove)! Here is one of his works: THE COVER! Hope you like it! The master of SAVN's debut album is now finished by the king of the producers Alexander Krull in his studio Mastersound Entertainment!! Both SAVN and us are extremely satisfied with the result, and we can`t wait to show you the 11 songs (included 2 bonus versions). The release of the album will be in the first quarter of 2014. Sorry for the delay, but SAVN needed some time to get all the instruments recorded. We are happy to announce that we have recently signed SAVN. The band consist of Carmen Elise Espenæs (MIDNATTSOL), Stig Johansen and Anders Thue (Both THE SINS OF THY BELOVED). The release of their debutalbum is scheduled late 2013. Stay tuned for more detailed info regarding the release! We are proud to introduce CDR Records! The label was born in February 2013. 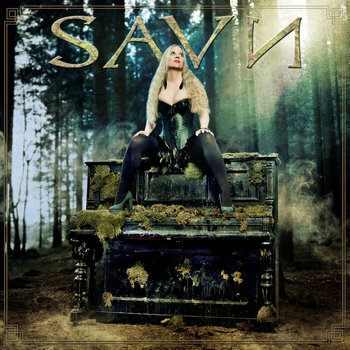 Epic debutalbum by Savn! Members from The Sins of Thy Beloved and Midnattsol. Check out the amazing feedback in PRESS section on homepage!